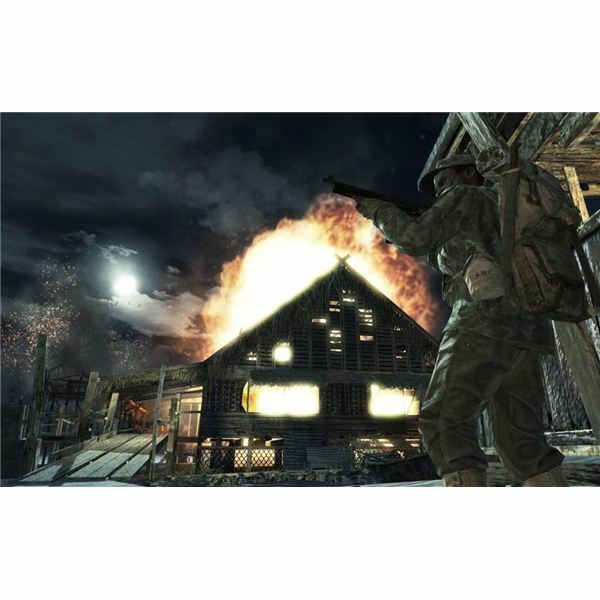 Call of Duty: World at War, also known as Call of Duty 5, is the highly anticipated follow-up to Call of Duty 4: Modern Warfare. Although I think the World War II shooter genre has been done to death, that doesn’t stop this game from being a lot of fun. It is currently plagued with technical problems that I hope will soon be fixed, but if you can get it working you’ll have a lot of fun. I still don’t think it is quite as good as CoD4, but that was a tough act to follow. I’m going to pull double duty with this article by making it both a review of CoD5, as well as compare and contrast the differences between CoD4 and CoD5. Like many gamers, the first thing I wanted to know about this game was what made it different that the last Call of Duty, so I will cover those bases. This new game has basically the same features as the last one, but with a different setting and bigger maps. I wouldn’t go so far as to call it a glorified mod of CoD4, though. Call of Duty 5: World at War is a first person shooter set in World War II. 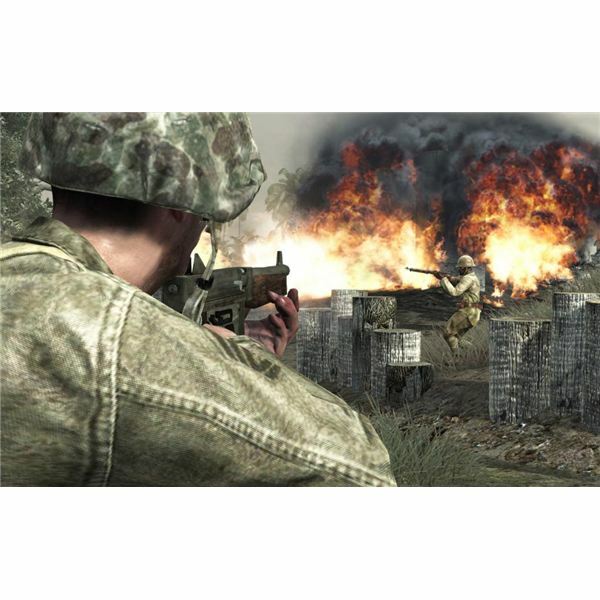 It is built on the Call of Duty 4: Modern Warfare game engine, so the look and feel of the two games are very similar, though this one has slightly improved graphics. Since it is set during WWII, you can play as Americans, Russians, Germans, Japanese, and more. It features online multiplayer and co-operative gameplay, bigger maps than ever before, and lots of weapons to choose from. At any given time during the day or night, you can find thousands of people already playing this game online. One of the biggest additions to CoD5 is the ability to play co-operatively online with other players. This is something not usually found in PC games, but does often appear on console games, such as Resistance: Fall of Man for the PlayStation 3. Another new option is the ability to drive vehicles – mainly tanks. You don’t have as many lying around as you would in a Battlefield game, but it is still fun to take people out with a tank. The maps in this game are also bigger and taller than before, with more buildings to get into and places to hide. There’s still no place totally safe from harm. Finally, the graphics are improved, and even gorier since it shows people’s limbs getting blown off. I am running an HP brand PC with an AMD x2 5000+ processor, 3 gigs of RAM, and an nVidia GeForce 8600GT video card. Needless to say, my computer more than meets the base system requirements for this game. I’ve found that it runs just as smooth as CoD4 does, though the graphic detail seems to be a little better in some parts. The environments are all very well detailed with lots of places to crawl, climb, and hide behind. The overall color scheme of this game is pretty dark, with some maps taking place at night. Most every location involves some kind of bombed-out warzone, so things are broken and in disarray. One notable difference between CoD4 and CoD5 is the amount of gore. In this game, you will see a lot more blood when somebody gets gunned down. You’ll also see arms and legs blown off when your guy gets killed by a grenade or tank. In fact, there is a challenge later in the game where you get bonus experience points for blowing somebody apart. The sound in this game is truly excellent, and it makes perfect use of surround sound. I am playing this game using the built-in Realtek sound drivers that came on my HP computer, and I have a Logitech 5.1 channel set of gaming speakers attached. Sometimes games will feature surround sound and you can’t really tell the difference, but you can in this game. I should also add that this game is filled with profanity, including even the F word, so be careful when playing it around youngsters…or your parents. For me, the main reason to get this game was to play online. I spent maybe 30 minutes in the single player portion just to get a feel for the weapons and controls, then I tried to get online. To my dismay, I had a lot of problems due to various technical issues with getting the multiplayer portion of this game to work. Two days later, I finally got it going and have been enjoying it tremendously ever since. I had to take a break from it just to write this review! The multiplayer portion of this game is very much like that of CoD4, with the main difference being the layout of the maps. In this game, the maps are not only slightly larger, but also have more multiple levels than before. Each map is full of more buildings and underground tunnels than any of them in CoD4, and this makes for a lot more difficult experience when trying to hide from snipers. Due to their size and complexity, I am still trying to learn the layout of each map. This game uses an experience point system to determine your rank. As you gain XP, you will unlock better weapons and accessories, plus unlock more challenges for you to complete. You’ll get experience points for each kill, each flag captured, and so on. You’ll also get points after killing so many enemies with a particular weapon, plus there’s a variety of oddball challenges like falling from heights or doing very specific tasks. One thing I really like about this game and CoD4 is that the ranking system is still very balanced, and by that I mean a 1st level grunt can still be competitive with a 55th level general. It’s not like PvP in World of Warcraft where a few extra levels on someone means you’re going to pound them into the ground. In this game, about all you really get with higher ranks is access to better weapons, but a bullet from any weapon will kill you just the same. On top of that, you can take someone else’s gun after you kill them. If I had started playing Call of Duty 5: World at War and Call of Duty 4: Modern Warfare at the same time, I would have spent a lot more time in CoD4 than CoD5. However, I’ve mastered CoD4 so much that I had to move on to something else, and CoD5 will hold me over for now. I was really hoping for another modern combat type game instead of another WWII shooter, but at least the developers kept many of the same gameplay aspects that made CoD4 so good. I just hope they can get the technical problems worked out before this thing goes into the bargain bin. Reviews and previews of Call of Duty 5: World at War.